All rooms have an en-suite bath or shower and toilet. In addition coffee and tea making facilities, TV, radio, telephone, free internet, a wake-up system and hair dryer. The deluxe rooms offer more comfort including a refridgerator. Some offer romantic canal views, others overlook the historic city centre. Smoking is not permitted. Check Rates. Every morning a rich selection of buffet breakfast is served. We take your order at the table for coffee and tea. Breakfast is served Mon – Fri from 7.00 to 9.30 am and on weekends from 7.30 to 10.00 am. 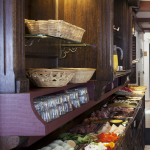 We restock our buffet regularly during service to ensure that all food remains fresh and plentiful. 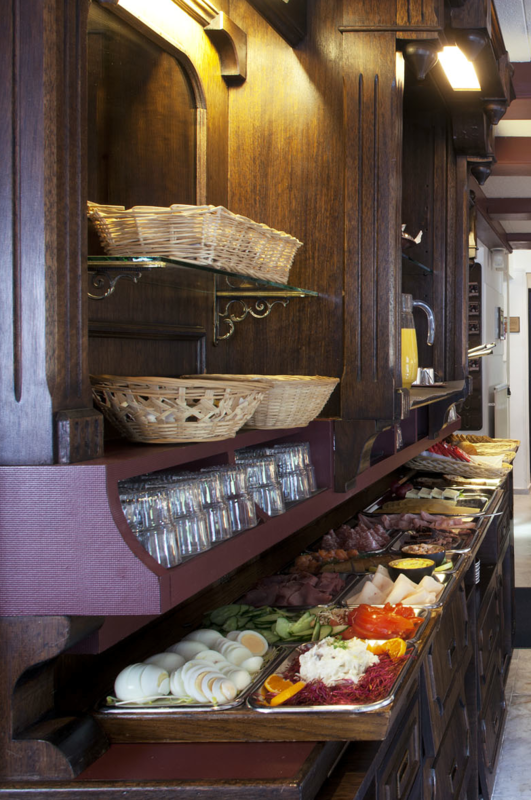 Even for the late comers the buffet will be replenished so you can start your sightseeing day full of energy. You can check-in from 2.00 pm to 11.00 pm. Early arrival? Let us know ahead of time. There is nothing more relaxing than arriving after a exhausting journey knowing that your (bath)room and breakfast are waiting. Additional fees apply. Unexpected late arrival? Remember to inform the reception so we can arrange your check-in. Take your time until 11.00 am to quietly prepare your departure or to just visit the city one more time. Will you depart by the end of the day? You may want to consider a late check-out offered at a day-use fee only. Storing your luggage on the day of departure is available until 11.00 pm however we do not take responsibility for any theft or damage. If you would like to skip your stay by one day, due to a day-trip, then you might want to consider storing your luggage safely in our secured luggage office. Alternatively you can apply for a day-use deal to extend your room availability. Available only on request, at a discounted rate of €30 per room rate (twin-use). Bicycle holiday planned? The hotel has a secure and lockable bicycle parking with powerpoints for recharging electric bicycles batteries. You are entitled to cancel your booking until 48 hours prior to arrival without charges. Cancelling within 48 hours of your visit, may incur extra charges. For room bookings of 3 or more, the Uniform Conditions for the Hotel and Catering Industry (UVH) will apply. Do you work for a company or business? Please contact us to discuss more favorable terms and rates. The hotel has a number of (deluxe) family rooms where extra beds can be easily accommodated. Children over the age 8 years are welcome under the supervision of their parents or guardian. One older child or adult is charged €16.00 per night for extra beds (on luxe family rooms only). Any type of extra bed or cot (apartment only) is available upon request and needs to be confirmed by the hotel. Hotel Leeuwenbrug has a 3 star Benelux rating. All linen and pillows are hypoallergenic. For the health of our guests, which may suffer an allergic reaction, pets are not allowed. All rooms are equipped with a refrigerator. All rooms are non smoking. A €175.00 penalty applies for the cost of cleaning, laundry and loss of rent. The room will be out of order as a result. No guest would accept a smoke damaged room. All costs will be added to your itemized account upon check-out. There is an ironing board in the room. Iron available on request.